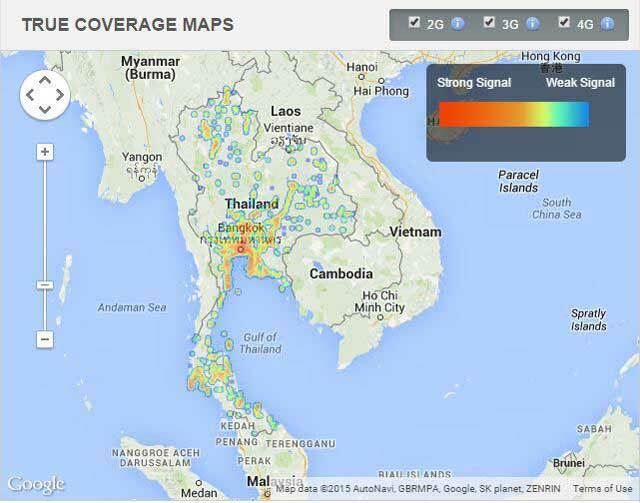 Do you want mobile phone signal on your island hopping in Thailand? We tested the options, see the results here. 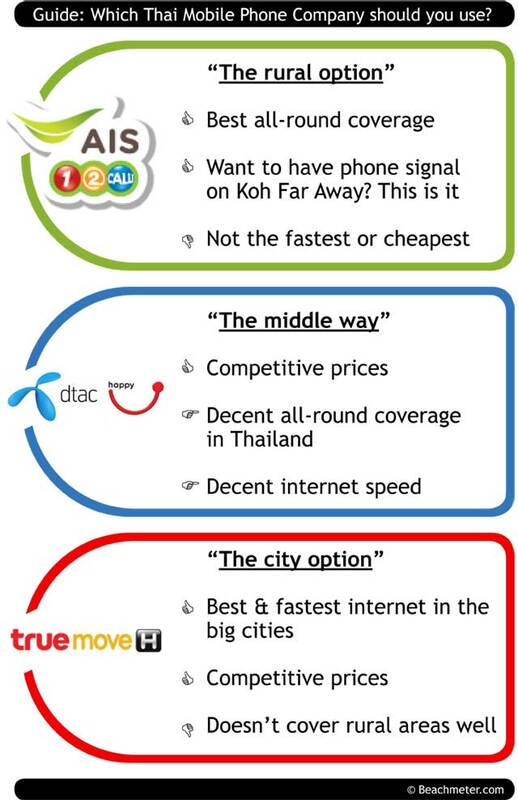 Before you buy a Thai sim card, be sure you buy from the company that best suits your needs. In our previous post, we argued that there are several good reasons for acquiring a Thai sim card for your stay in Thailand. However, the further you get away from the cities and popular vacation spots, the harder it is to stay connected. If you stay on Koh Samui, Phuket or Hua Hin there will be no such issues. But are you island hopping to Koh Kud, Koh Mak, Koh Muk or Koh Kradan you need to use the right Thai mobile phone company. For the purpose of island hopping and exploring all corners of Thailand, we definitely recommend AIS (12Call). Prices do not differ much between the mentioned companies, and for a lot of beach aficionados it is nice to have the option to communicate with friends and family, and check your email without burning a hole in your pocket. Bear in mind that Thai mobile phone companies constantly look to upgrade their coverage, adjust their rates, launch promotions, and provide better and faster internet. So remember to keep yourself updated before you buy. 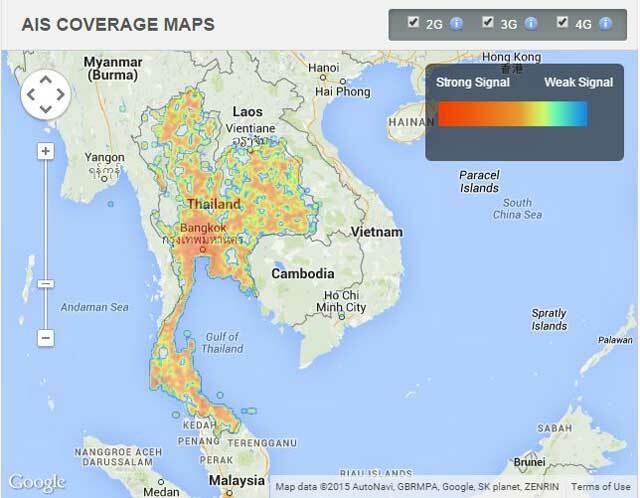 As you can see, the coverage has significantly improved over just a couple of years. 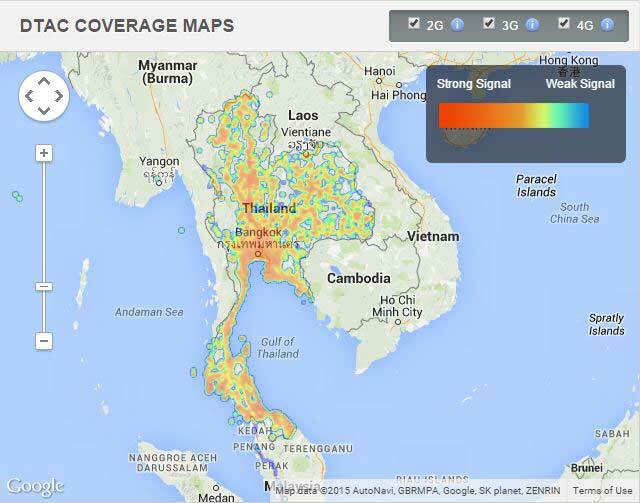 Especially TrueMove has improved their coverage throughout Thailand. 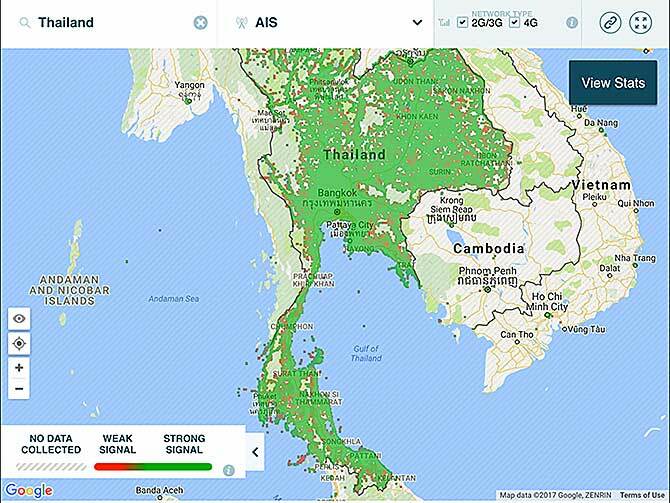 If you are going to remote islands or rural regions in the country, we still recommend that you research the mobile coverage before you buy your Thai sim card. 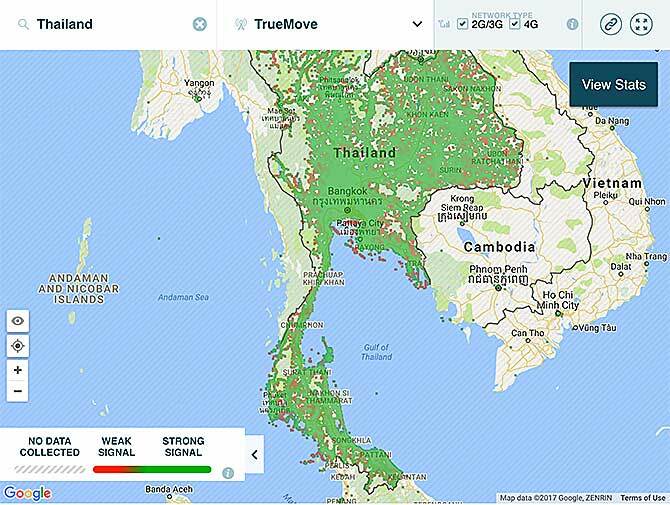 On OpenSignal, you can type in the exact location of your stay and quickly learn which Thai phone company suits you best. Previous postHave you ever thought “Thailand is too touristy for me”? This is a very helpful article thanks. Apparently True Move is now the best coverage even in rural areas. Any suggestion between prepaid and postpaid ? Postpaid plans look more interesting – are they harder to set up ? Hi Maxime. We just updated this post with new information about the coverage. Indeed, it looks like True Move has improved a lot. If you use your phone daily for calls and data, it is most economical to make a monthly subscription to one of the data/calling packages. However, if you are on a tourist visa, you will (usually) not be allowed to register. Then you will have to make do with your pre-paid plan. I have been using AIS 1 2 Call for 12 years without a hitch until now . I almost never pay more than Bt100 and then when my money has run out . I am an elderly man and use my telephone very little , so do not make payments on a regular or monthly basis . AIS has cut me off so I can only receive calls , when I have Bt80 credit . I believe that it is a new AIS policy to cut off the outward telephone service to people who do not pay precisely every month . A friend was cut off while he was on a month’s holiday abroad , he was Bt600 in credit . I am disgusted with AIS !!! I am looking at this site with a view to changing to another company .